Recent AT&T commercials have been telling us that more is better. We can think of some areas where this might not be true (e.g. warts, traffic jams, tornados), but when it comes to curtain tracks we couldn’t agree more. Why hang only one curtain track when you can hang two? Our double wall brackets make hanging two parallel tracks a breeze, and are sleeker and more stylish in profile than a bulky, cumbersome double-rod system. Our 84172 Extra Long Double Bracket is available in silver or white and allows two of our 84003 Ball-Bearing Curtain Tracks to be installed in parallel with four inches of clearance between the tracks (to allow room for each curtain to fold). You will need to place a wall bracket every 24 inches in the areas where the curtains are stacked, and every 48 inches in the middle of the track. 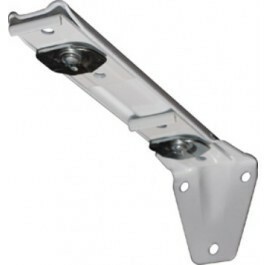 This bracket needs 6.5 inches of clearance from the wall, and you will also need drapery hardware such as ball bearing carriers and an end cap that anchors the end of the curtain panel to the end of the track. So now you’ve got the how. How about the why? Most of our double-bracket customers want this product to hang a set of sheers behind a set of Eclipse light-blocking curtains. This creates a very elegant window dressing, but is also very functional as it gives you three options for the look of the room: Both curtains closed for a dark, private room, heavy curtains open and sheers closed for filtered light, or both curtains open for a bright, airy look, and (hopefully) a nice view. Of course, you can come up with your own creative uses for parallel curtain tracks, and with decorative curtains and shades of sheers, the combinations are endless. We want to help you plan and install your double track project. Give us a call at 888-434-7444.